You might want a pond as a wildlife haven, or just a water feature. Large or small, we work to high standards with the best materials. 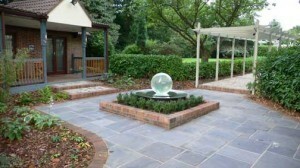 Water can be incorporated into a traditional or modern garden design. This is a bespoke stainless steel and Perspex water feature with an internal light. 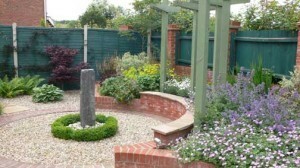 It works well in this formal area of the client’s garden. 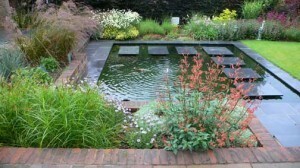 The stepping stones of this formal Koi pond were carefully built to make sure they are perfectly level. For low maintenance we used high quality pumps, filters and lighting. Made from slate, this monolith could work in a traditional or contemporary space. Either way, it makes an excellent focal point. The pump is an underground reservoir. This natural looking pond has no filter system because of the planting used. 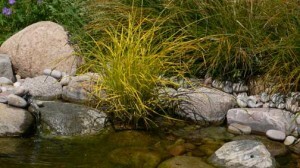 Having the right balance and species of planting can help to keep the water clean.